Every year, no matter the kind of year just closed, no matter the hopes or anxieties of the coming year, one thing stays the same. 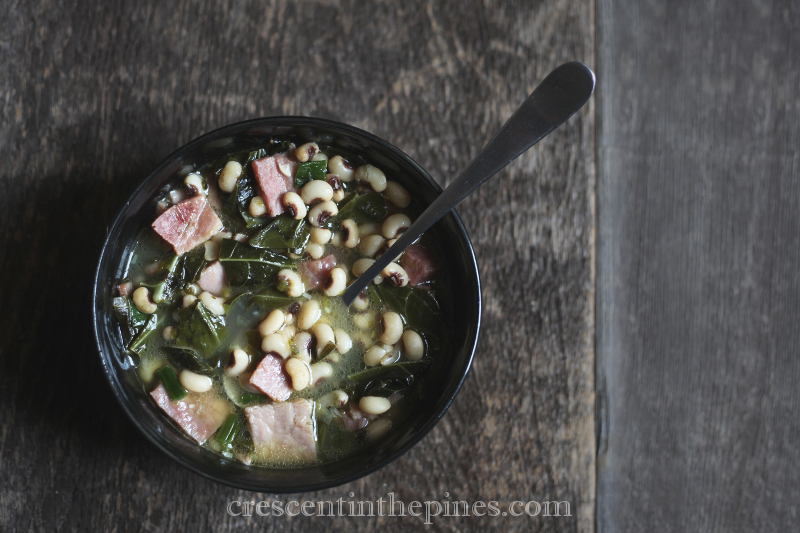 Well, to be more accurate, four things: pork, greens, cornbread, and black eyed peas. Today is vaguely unceremonious for all my excitement at ousting a tiresome year. All the seed cases have been sorted and a list of needed seeds and other garden accoutrement made for the coming season. The annual Twilight Zone marathon has droned on for more than a day. But more than anything, it is a quiet day, calm and tranquil. Rather than casting forward nets toward mighty goals as was my proclivity with yesterday’s goal noting endeavors, today is all about the quiet. After too many months trapped in a forward moving and somewhat productive but more so deeply stormy and saddening year, today is like the first break in the clouds. Our house feels restful thus wrapping up garden planning, idly prattling away in the kitchen, and reading up on new to me ideas in soil amending sound ideal. Here is to a serene year filled to the brim with luck. 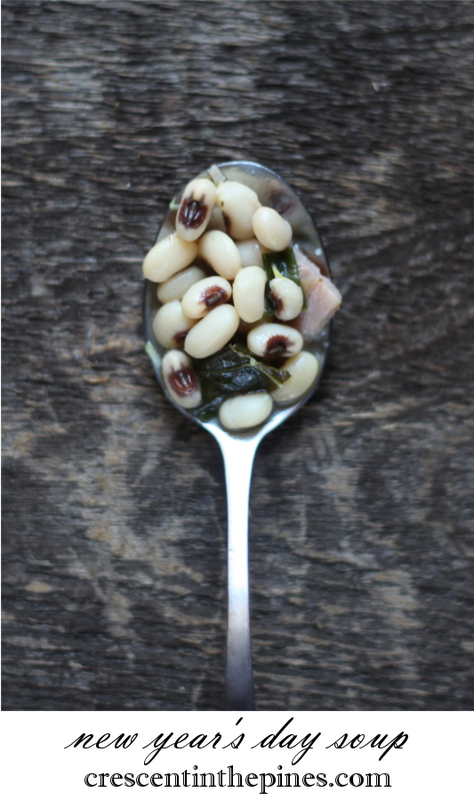 Wildly superstitious and too hillbilly blooded for my own good, I never miss a meal of greens, ham, black eyed peas, and cornbread for the first eats of each year. Whether or not you believe in the good luck mojo of these vittles, this soup is an amazing combination of all but the cornbread, which makes the perfect sopping companion for this meal. Over the last few years, I’ve honed this adaptation from Southern Living for those years when the first comes cold and soup in lieu of hog jowl speaks to my appetite. In a large pot, heat butter and bacon grease over medium low heat. 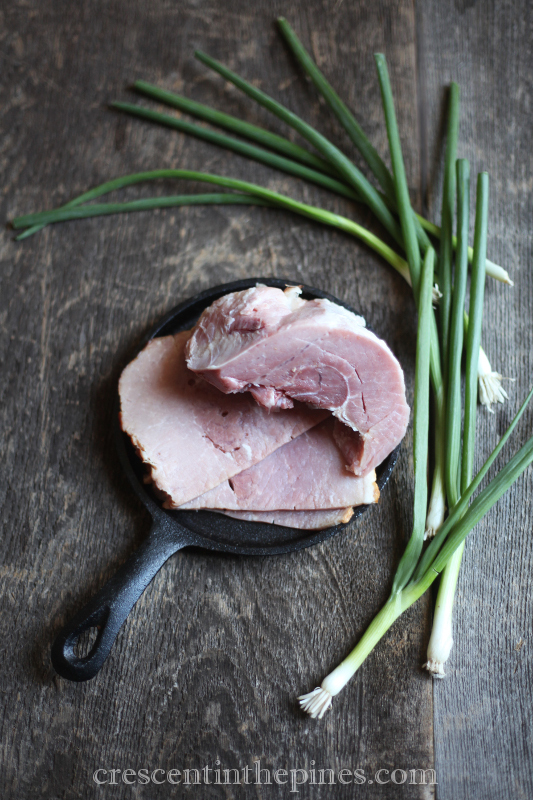 Add ham, onion bulbs, and garlic. Cook, stirring, for 2-3 minutes, just until fragrant and heated through. Add the water, broth, greens, Tabasco, black eyed peas, and a dash of salt to the pot. Bring to a boil. 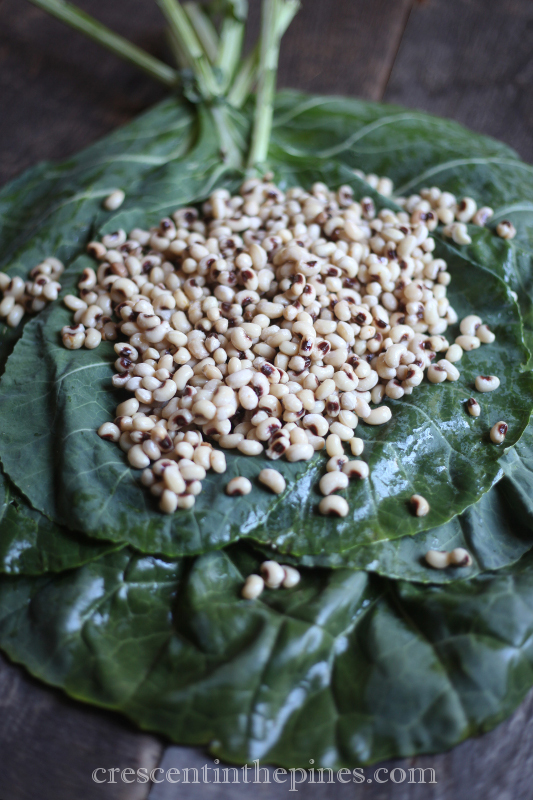 Reduce the heat and simmer, partially covered, for 20-25 minutes or until black eyed peas are tender. Remove from the heat and stir in a teaspoon of pepper, the vinegar, and green onion tops. Add additional Tabasco, salt and pepper to taste. Serve with fresh cornbread. Notes: While fresh black eyed peas are best, frozen work just as well. Avoid canned. This soup keeps well in the refrigerator for a few days. Personally, I think it is even better the second day once the flavors have had all night to merge. If your taste leans away from spicy, you might turn down the Tabasco or use Louisiana Hot Sauce for kick with less heat.